More drilling will not reduce oil prices; when ever has increased supply undercut the price of a commodity before? When has the promise of increased supply ever dimmed the ardor of speculators, before? What ever would cause the price of a commodity to decrease, when its supply increases, anyway? Obviously, we can’t drill our way out of this. 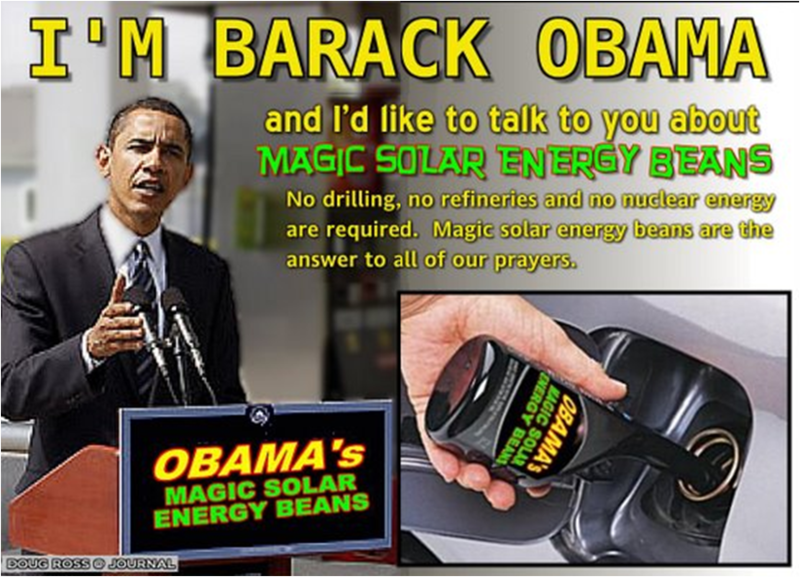 Since oil is a predominant cause of the Earth’s temperature going up, you need Obama’s Magic Solar Energy Beans instead. If your crops suffer vast widespread failure due to Global Chilling in the current Al Gore Minimum, you can cook up a mess of the Magic Solar Energy Beans instead of pouring them into your tank. Recipe book available. Just remember how warm the Earth was supposed to be (according to advanced COMPUTER models), and enjoy those Obama Magic Solar Energy Beans. Deja Vu: We did this before, in those progressive Jimmy Carter years! Why hasn’t solar energy done anything for us, since Jimmy Carter? I don’t know where they get the idea that if you drill, you get instant fuel. It takes years to get wells pumping. And if what I read at Energy & Capital – I read it for the oil price – people are being constantly encouraged to invest in these ‘plays’. Yes, well, somebody will get rich, I guess. Nuclear is, I believe, essential, but that takes around 15 years to get up and running. A gallon costs the equivalent of $9.50 here.